Individual follow-up questions depending on evaluation of the recipient. This function could be used to send follow-up questions after the main survey. You can setup individual questions for every single measurement. This will help you to find out why the recipient has opted for this review. - Go to „Surveys“. - Add a new survey or choose an existing survey over the button „Edit“. - At low range of the page you can personalize your survey. Please click on the tab „Follow-up Page“. - click on „Save“ to save your settings. With this function you can simply add testimonials from your customers which you haven't received via our tool (direct correspondence via email). - Scroll to the button of the page an click on the plus sign besides of „External Testimonials“. - Now you can fill in the name of the recipient and his testimonial you've received. Click on „Publish“ to save the testimonial. - After you've published the testimonial you can find a button to delete or edit the testimonial. - If you want to add an another testimonial please click on the plus sign again. Sometimes surveys will be forgotten or ignored by customers or the will be sort out by a spamfilter. To remind your customers automatically we've added a reminder to Callexa Feedback. - Add a new survey or choose an existing survey over the button „Edit“. - At low range of the page you can personalize your survey. - Within the tab „Survey Email“ you can find the option „Automatically send reminder“. Activate the option if you want to remind your customers automatically. Now you can setup an amount of days after they will be reminded. If you want to use an individual introduction please type it in field „Alternate Introduction“. If this field has been left empty our system will use the unchanged survey template. Important: We advise using this function only for surveys with acknowledged recipients, e.g. 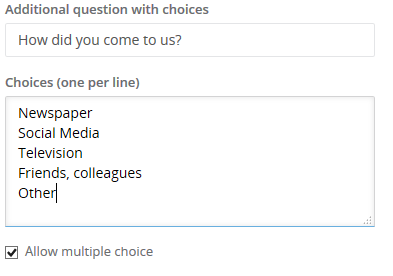 in employee surveys. 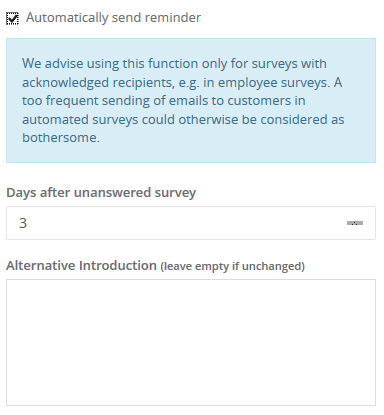 A too frequent sending of emails to customers in automated surveys could otherwise be considered as bothersome. - Click on save to save your settings. 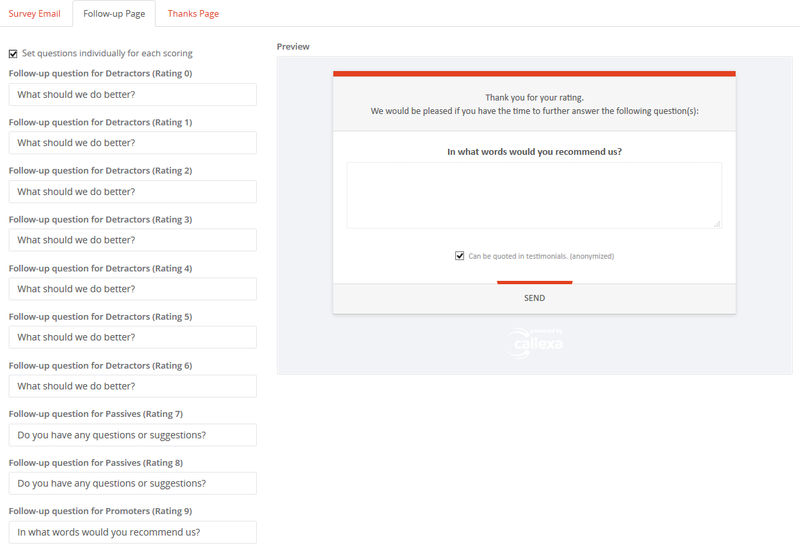 If you additionally want to know how your customers have found your company/product you can simply add an additional question with different choices to your survey. - At the end of the tab you can the field „Additional questions with choices“. Please fill in your additional question and add some choices. You can add one choice per line. If you want to allow multiple choice please activate the option „Allow multiple choice“. - Click on "save" to save your settings.